Bob Hurford has an excellent set of articles on dip pens at IAMPETH. He begins a tour of flex pens with the Gillott series of nibs as a bench mark and how all manufacturers had similar series of pens. For example Gillott's 404, 303, 290, 170 had equivalents in Esterbrook 358,357,356, and 355 , Similarly Hunt had the 56, 22, 99 and 100 and so on.. These are a rarity these days., and Joseph Gillott being the pioneer of steel pens in the early 19th century, has a special place for collectors. A full box of Gillott 303 would typically go for $300 if one can be found. Esterbrooks are relatively inexpensive. 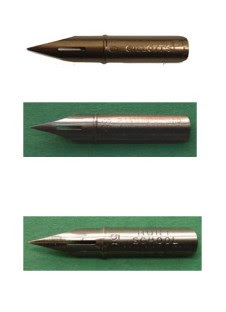 In his article Bob mentions how these pens were copied and imitated by several manufacturers. 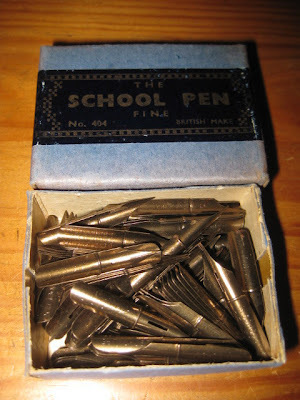 Recently I chanced upon a box of nibs in Ebay, curiously titled 'OLD ENGLAND SCHOOL PEN 404 '. I took a chance and got the box containing a full gross. ...and bingo ! They were as expected, clones of the 404 ! They are of great quality made of bronze and came from none other than Myers and Sons, another famous pen maker from Birmingham. Here are the 404, 358 and Hunt 56(also curiously called a School pen) ... amazingly similar. Needless to say this is one of the best class of dip pens, with solid construction, a reasonably good flex, and the interesting ridge allows more ink to be picked up during the dip. The Gillott though has considerably more flex than the others. With the right ink and a good solid wood holder these are a pleasure to write or draw. Of these the Speedball Hunt 56 is the only pen manufactured to this day. This is the treasure man! !